So the smart foodies on Yelp fall all over themselves praising La Taqueria, on Mission Street and 25th. 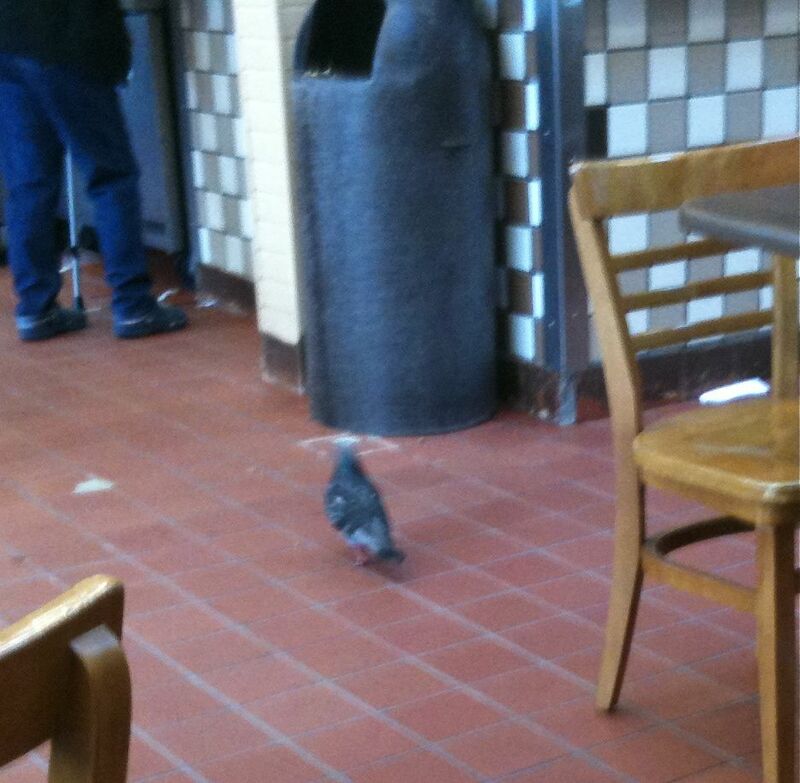 We had set out a month ago to review it, but it was closed for remodeling and we ended up at the place with the pigeon instead. This time we were not to be denied, and set out a little ahead of the lunch rush, because the place is crowded enough at all hours, and during primetime nearly unapproachable. So yes: it’s popular. “Yes, yes you are,” your stomach rumbles in reply, so you pass through the glass door. Inside the floor is covered with red clay tiles, on which rest heavy mission-style chairs and tables. Along the west wall is a counter with eight or nine hard working prep-cooks, grill station jockies, and taco and burrito assemblers churning out a steady torrent of food. Above them is a brightly painted menu board. They offer a wide selection of meats: the usuals plus lengua, cabeza, chorizo, and a vegetarian option. Tacos come with tomato salsa, beans, onions, and cilantro. Get this: they charge extra if you ask them to hold the beans, but offer the lengua and cabeza tacos with an onions-and-cilantro-only option. Never mind. They are so busy that a young woman walks up and down the waiting line taking orders and giving you a slip, which you patiently wait to hand over to a surly man at the register who then delivers your order to the cooking line. When your order is up they call your number and you get your food. Also while you wait you are afforded the chance to engage in pecuniary discourse with gentlemen of the grape, who have staggered in from the mean streets of the Mission to emit a certain aromatic enhancement to the atmosphere as they lurch from table to table. Perhaps this special facet of the La Taqueria experience accounts for its popularity, because the tacos are certainly nothing special. Don’t get me wrong: they’re good, but certainly not as good as those at, say, La Fonda or Guerrero’s. I had the cabeza, the lengua, and the carnitas, along with an icy cold Pacifico beer. 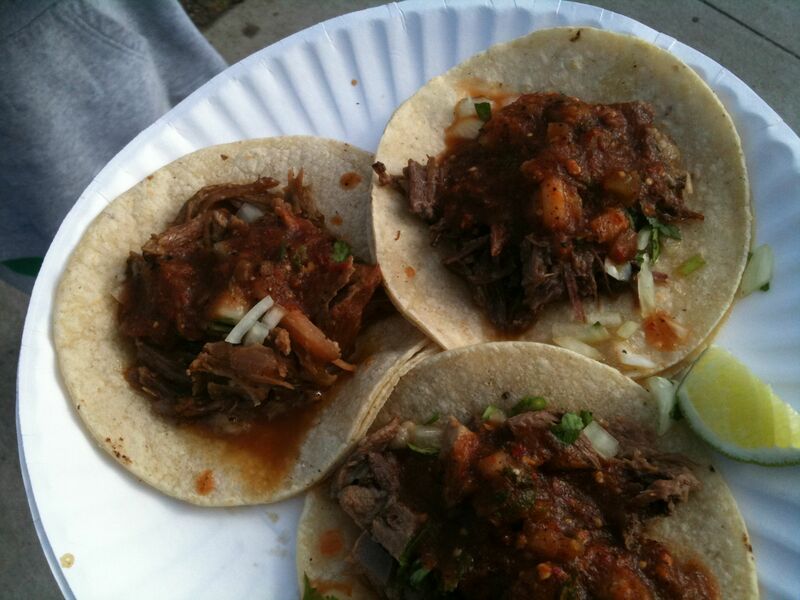 Good, but not great: the carnitas was a little dry, the lengua over salted, and the cabeza just fine. Their salsa is conventional, but well executed. Now here’s Matt on the burritios: Boy, bragging never gets you anywhere. They have a neon sign on their walls saying LA TAQUERIA: The best mexican food in the world! Yeah right. LA TAQUERIA: The most mediocre mexican food in the world! sounds more real. I had a carnitas burrito that tasted like the best mediocre burrito I ever had. It was a small sized one, with almost every ingredient. (Not that many ingredients were available) This burrito was the kind of burrito that was-here’s that word again-mediocre, but it’s also that kind of burrito that makes you full after three bites. And they don’t even have any authentic mexican drinks! MEDIOCRE!!!!!!!!!! Time off from school and a series of rainy days caused us to stay close to home and look indoors for tacos a few weeks back. We landed at two unusual locations. This was good news and bad news. 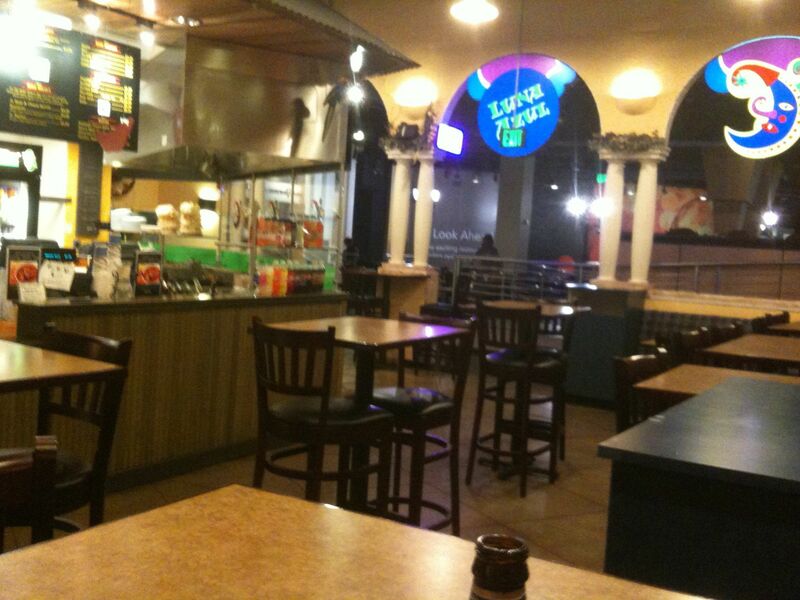 We went to The Metreon to see Diary of a Wimpy Kid, and stopped in for lunch at Luna Azul. Friday we walked down Irving Street in the rain to Nick’s Taco Shop at Underdog’s Sports Bar. Yes, I know there is a name problem. We had vastly different experiences at each place. When it opened in the early 90’s The Metreon was supposed to be the future of urban shopping malls: a combination of civic open space, high tech shopping venues, entertainment for kids, martini bars for grownups, and lots of visual freneticism to keep it all exciting. Now it’s mostly empty, its retail stalls boarded up and nearly all the restaurants closed. The only things left breathing are the movie theaters and Luna Azul. The staff is friendly, the menu spare and easy to understand: tacos, burritos, enchiladas, quesadillas, and platos. 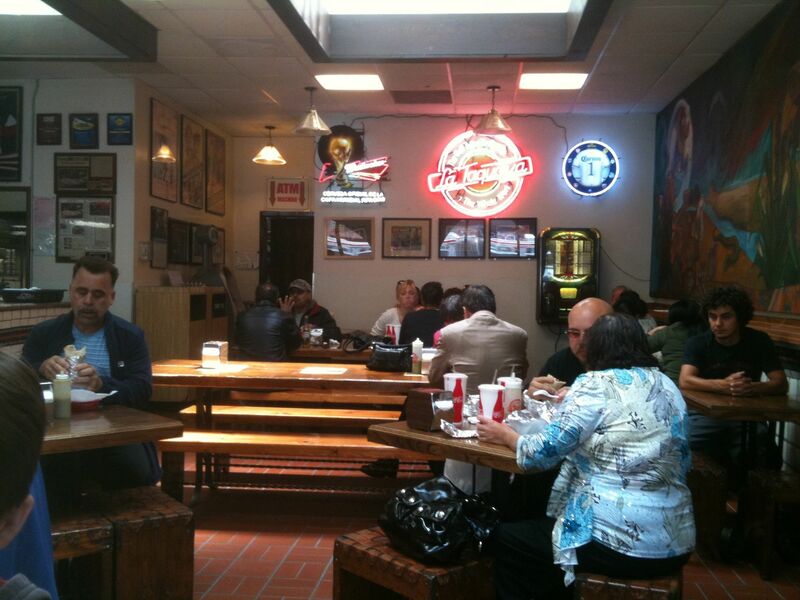 They have a selection of beers and soft drinks, and tables in a clean, colorful dining area. You order from the front counter and await your number to be called, and pick up your food from the register. I ordered the chicken taco plate: two soft tortilla tacos, beans, rice, and lettuce. Matt ordered a quesadilla. The beans were excellent: rich and creamy, but still firm to the bite. The rice was standard Mexican rice. The tacos? Sad to say, the torillas were dried out, and so was the chicken. The lettuce and pico de gallo gave it some moisture, but really, I had to sip my drink with every bite to enable me to swallow. Here’s Matt on the quesadilla: Notice how I tried Quesadillas. 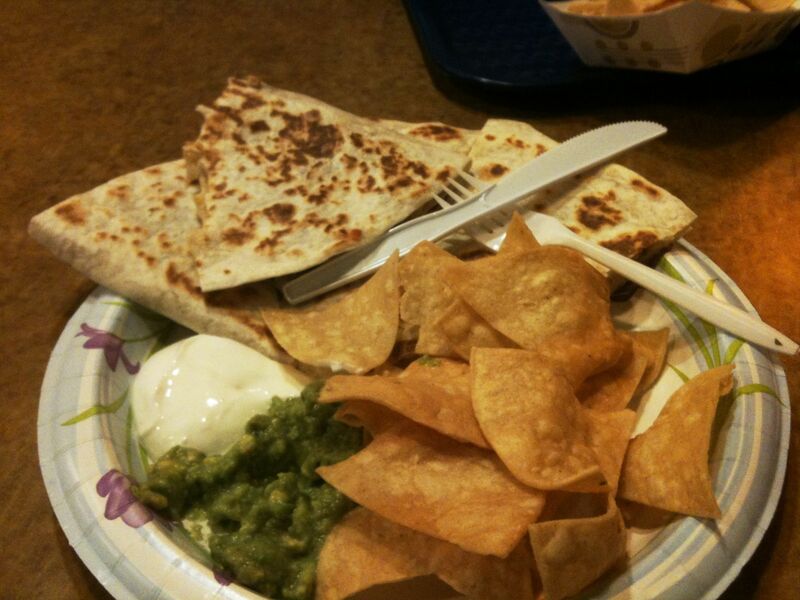 I looked at the burritos and tacos, and I said, “I’m gonna try the Quesadillas.” These Quesadillas were good. The cheese was nice and perfectly grilled, and so was the tortilla and steak. So I’m going to give it a thumbs up. 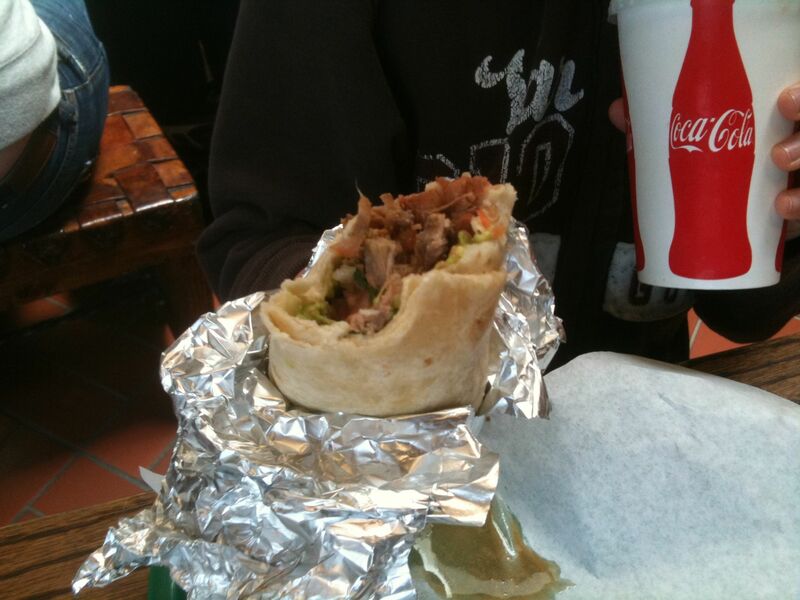 A few days later we trudged through the rain down Irving Street to Nick’s Taco Shop–on the list of 1oo Things to Eat in S.F. Before You Die. What a different experience. Good tacos at a sports bar you say? Fergedaboudit. Fine, you say, but what about the tacos, the tacos, the tacos. Here’s Matt’s take: If they didn’t make sure the taco wasn’t 45% guacomole, it would be great. I’m not saying it was awful, it’s just that they seem to like guacamole a little too much. The meat is great, the guacamole itself is good, ant pico de gallo = OMG great. The sodas are refreshing, and great chips ‘n’ salsa. Oh, and next time, I will get back on track with the burritos. 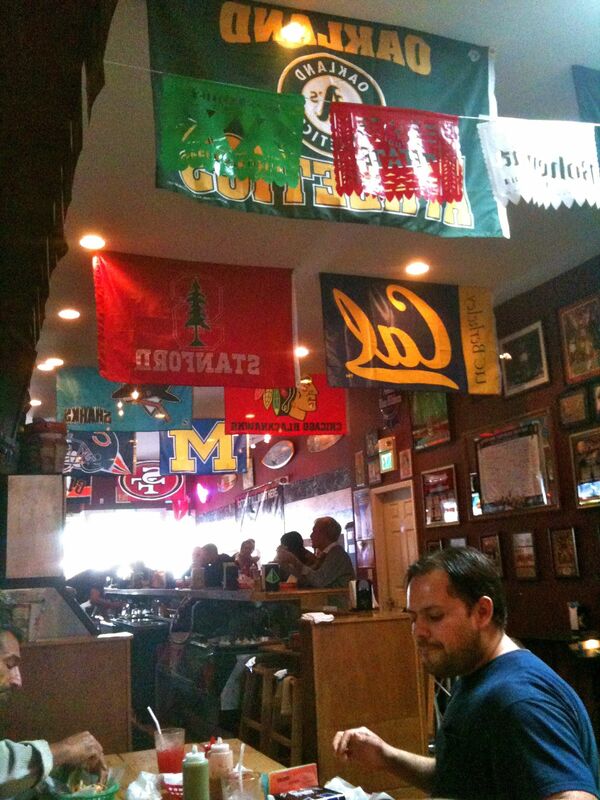 Everything was terrific… if you like a sports bar. There are twelve different flat screens going at any moment, and they are tuned to very different channels. Fortunately, the sound is off: the din is provided by the patrons. There are video games for the kids, so if you’re hell bent on watching that crucial Tampa Bay v. Kansas City game, you can do so without junior awakening your inner Al Bundy. My favorite time there is on a weekday mid-afternoon, when there are no games on and no crush of avid taco-scarfing sports addicts. It’s a bright, colorful, sincere place. They want you to like the food they produce, and take pains to insure that you do. I’m not saying that Luna Azul doesn’t have the same vision, but I can say that, if they do, they don’t know how to make it work. Nick’s does, and my neighborhood is the better for it. They have their own Google Map. They are all the rage down in Los Angeles. There are too many blogs about them to name. 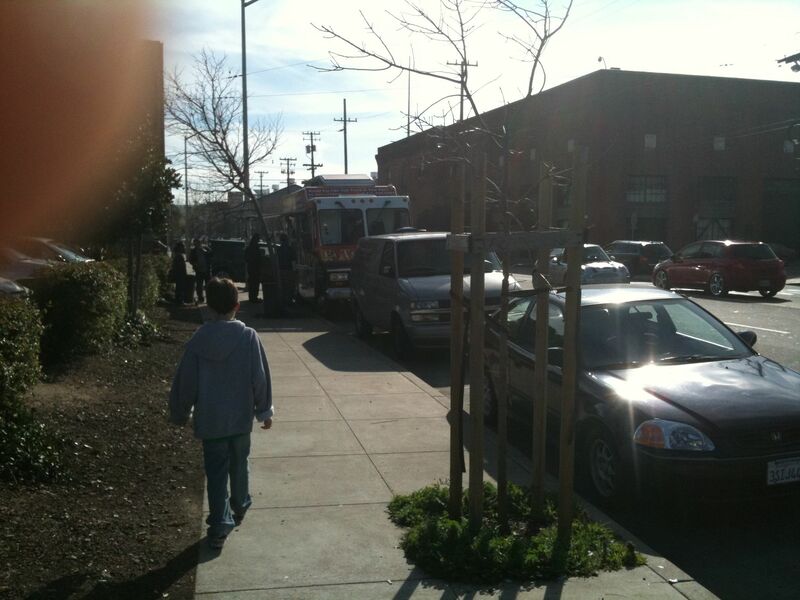 So yes, it was time for The Taco Seekers to seek a Taco Truck. Matt hosts this edition of Gringos Take on Tacos, in which the Gringos take on El Tonayense. Waiting in line, gazing at the menu. 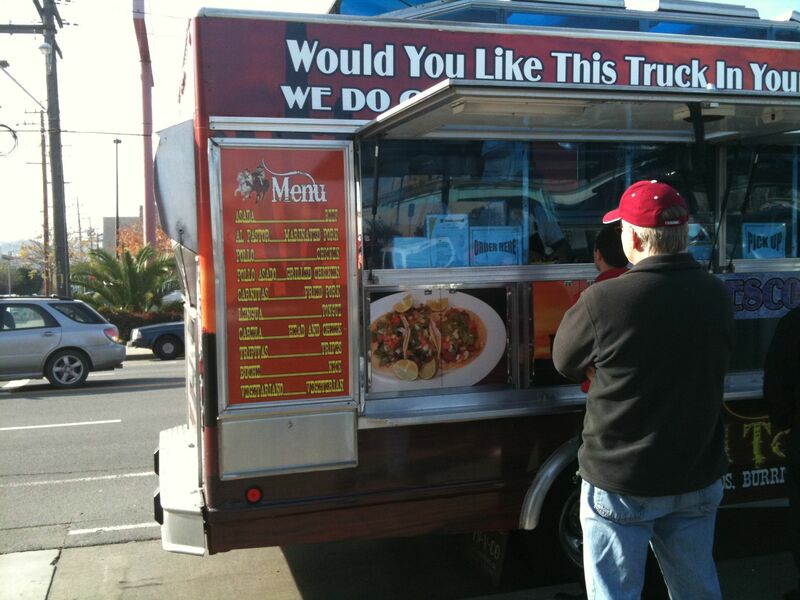 you stand out on the side of the truck in line, and the menu doesn’t show what they have.(ex. burritos, tacos, tostadas, etc.) They only show what meats they have.(ex. pollo, carnitas, asada, etc.) They have almost every kind of soda you can imagine, including those mexican sodas with real sugar. Now: THE FOOD. I’ve been here before, and I had their burritos: Yummy, yummy, yummy, satisfactory yummy. 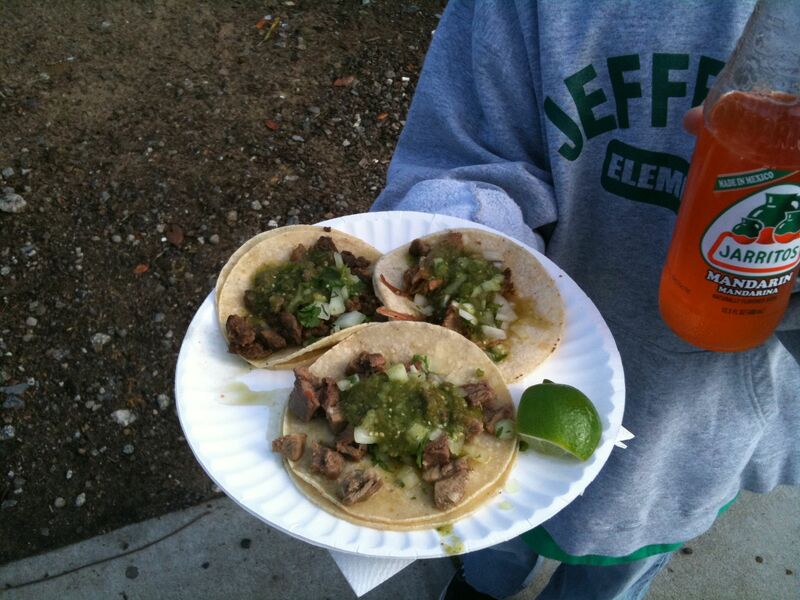 But this time I had their tacos: one lengua, one carnitas, and one asada. 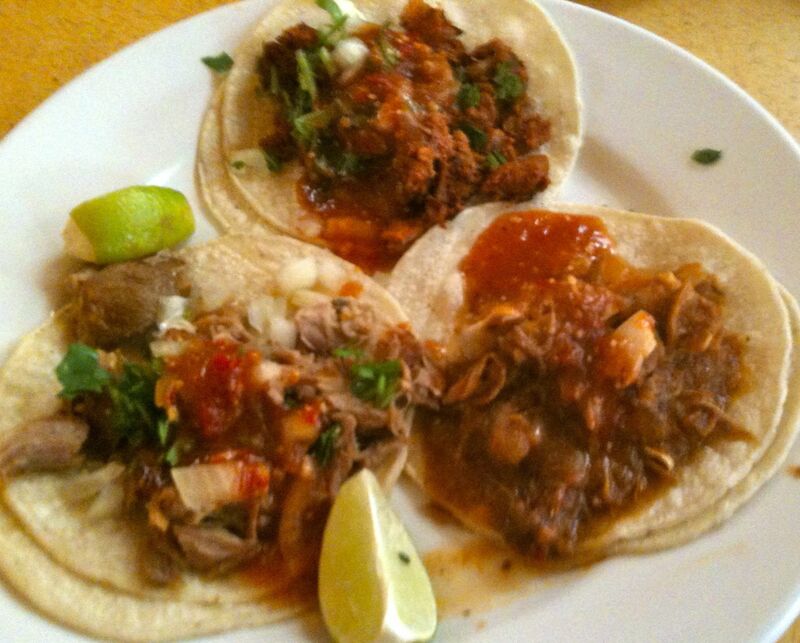 Clockwise from left: cabeza, carnitas, and lengua. Atmosphere: Whatever your car or the weather is like. 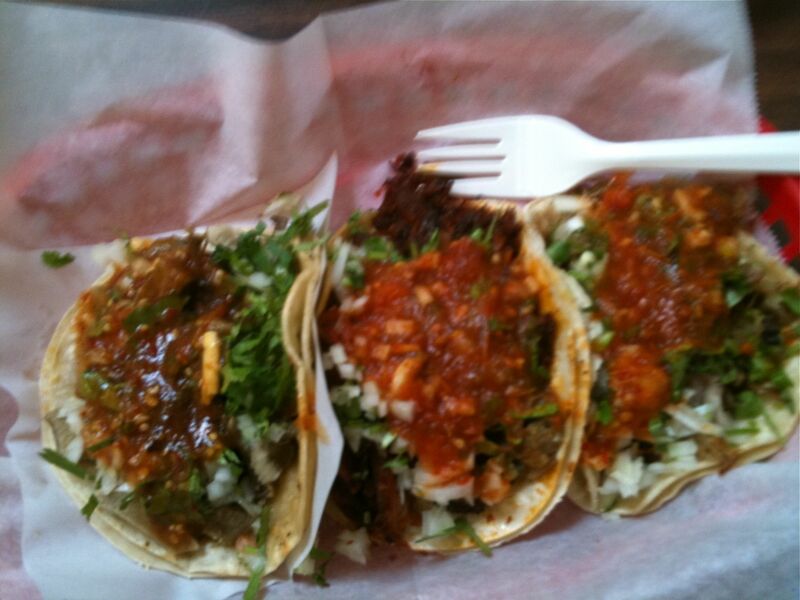 From left to right: cabeza, al pastor, carnitas. They were good. The al pastor did not quite deliver on the promise imported by the sizzling vertical roaster, but it was plenty good nonetheless. The carnitas was a little dry, as were the tortillas. The cabeza, however, was outstanding. 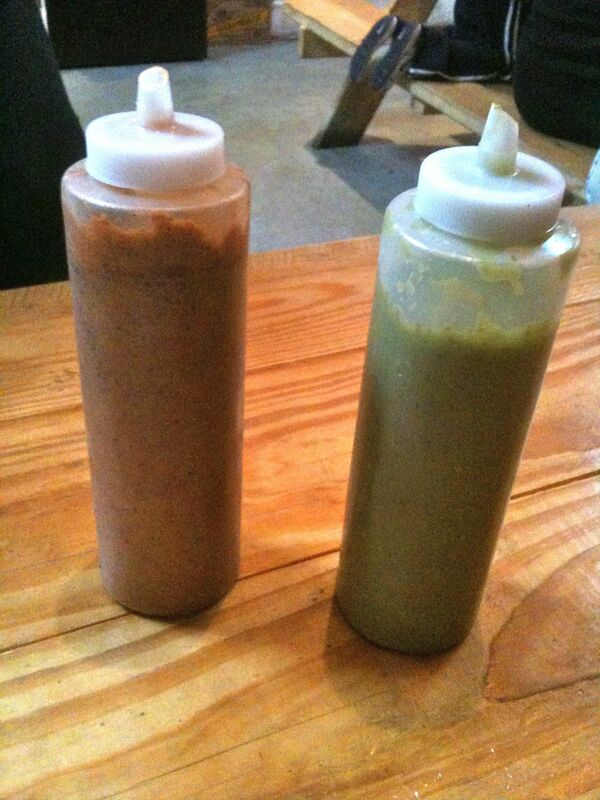 All three came with different salsas, though they shared one quality: hot hot hot hot. I was sweating as if I’d just run a half-marathon. Loved. It. 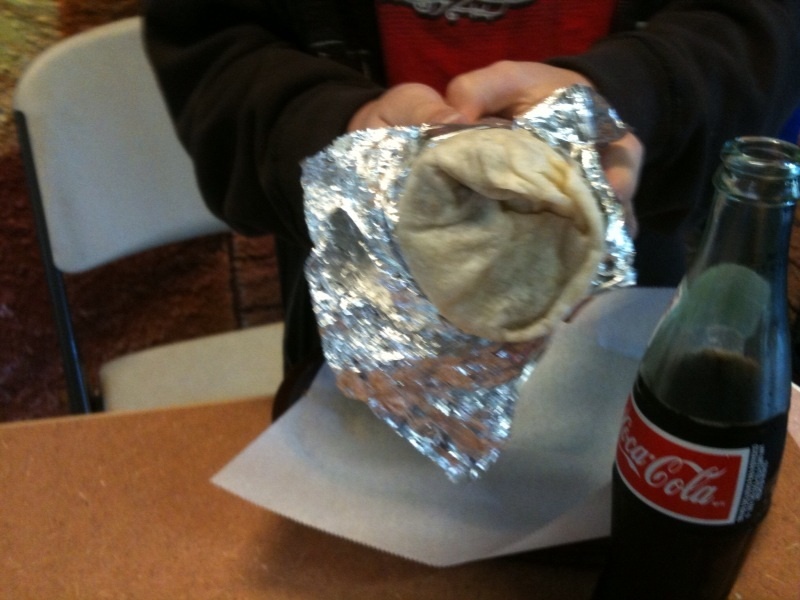 Matt ordered a burrito, viz. : It was too big for me, but it was goooooood. Not great, but it’s just got that, like, you know, gooooood feeling. It contained carnitas (If you’ve read our previous posts, you’ll understand we like carnitas) beans, rice, cheese, and sour cream. I say it was goooooood. Although it was filling. The atmosphere is pleasant: rafters festooned with faded Corona piñatas, the large mural noted above, loud banda and mariachi on the jukebox, and a steady stream of customers lining up at the registers of what is clearly a popular neighborhood spot. The Tacoseekers liked their time here. Give it a sample some time soon. Heat of salsas: FIVE peppers. Water! Please! Water! Other: Beer and soft drinks. Credit cards accepted. AKA La Fonda Mexican Grill. This establishment is a short walk from our house in the Inner Sunset. Warm and inviting, it offers clerestory windows above the entrance on the south side, allowing what sunlight we get here in Fog City to bathe the yellow and orange interior in brilliance. Five tables cluster by the front window (on warm days there are sidewalk tables as well) and up a short stairway a second floor opens into the room with more tables and chairs. 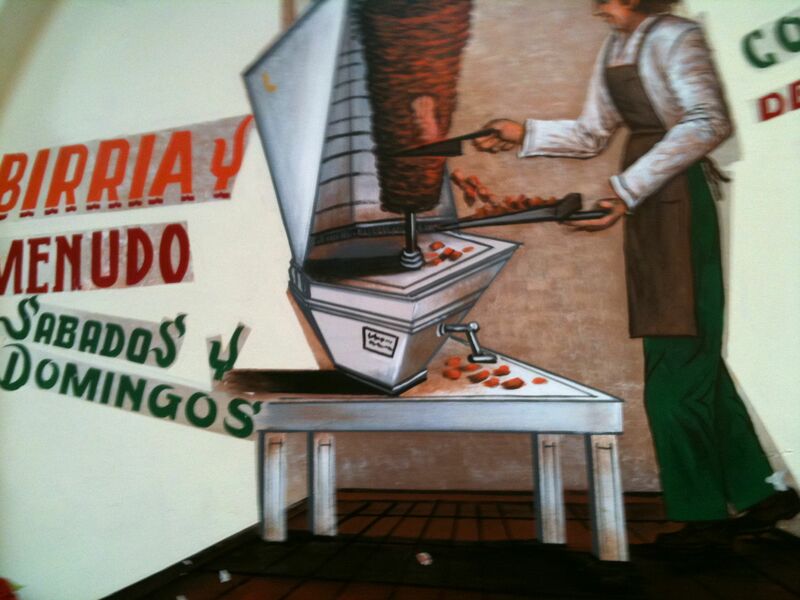 La Fonda does not follow the tradition of dinge and dirt that many taquerias do. Clean and friendly, it’s a place you could take your granny for her regular dose of cochinita pibil. And it happened every minute or two. And their owners thought it was the most goddamned funny thing they’d ever seen. Me: about to take a bite of my excellent tinga chicken taco. Dogs: ARKK ARF ARF GROWL ARF ARF!!! Me: I have tinga chicken all down my shirt. Crap. Dogs Owners: HAHHHA HAH HAH! Me: Insert obligatory old fart lament about the decline of manners here. Don’t get me wrong: dogs? Love ’em. Their people? Not so much. Though you, as a reader of this incomparable blog, are an obvious exception, should you choose to be owned by a dog. Enough about that. Let’s talk about food. First of all, this place offers a staggering array of meats and fillings for tacos, burritos, tostadas, empanadas, quesadillas, and other such conveyances. In addition to the cochinita pibil and tinga chicken, they have the obligatory carnitas, al pastor, chorizo, shrimp, salmon, chicken mole, carne asada, tofu (whatever), grilled vegetables, poached chicken, and a special taco filetito asado, a small piece of whole grilled ribeye folded into two corn tortillas. 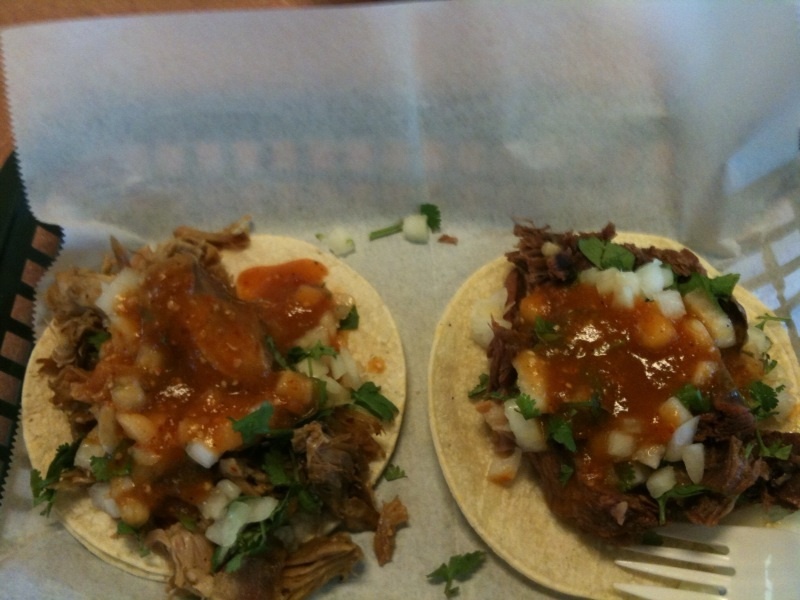 From Left to Right: Carnitas, Tinga Chicken, and Al Pastor at the top. There is an excellent salsa bar, well stocked and constantly refilled, an array of beers and soft drinks, and a quick, friendly staff. My tacos were good. The carnitas was satisfactory, if a bit low on flavor. The al pastor was passable, but a little dry. The tinga chicken was outstanding (although, as noted above, messy when nearly throw in the air from fright…). The chicken is stewed in chipotles and adobo, with a nice bite of heat and rich, almost chocolate flavors. All in all, a nice lunch. Matt: I have been to La Fonda before, and I disliked their burritos. I came and had their tacos, and that was way better. Like Guerrero’s, they have those awesome mexican sodas. I loved the carnitas! It was brilliant. But, I had their broiled steak, and that is their best. The place is near our house, so we go there a lot. Oh, and they define themselves as a Mexican Grill, instead of a taqueria. 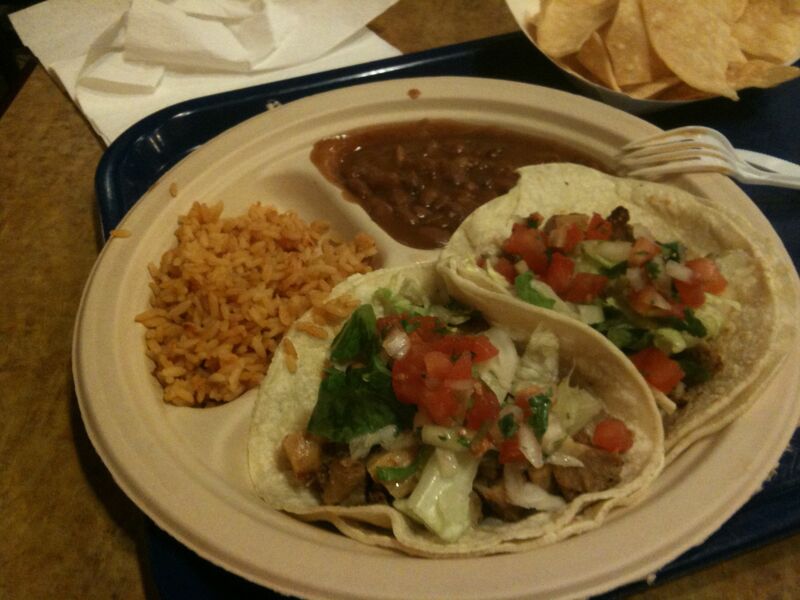 We recommend you give La Fonda a try. 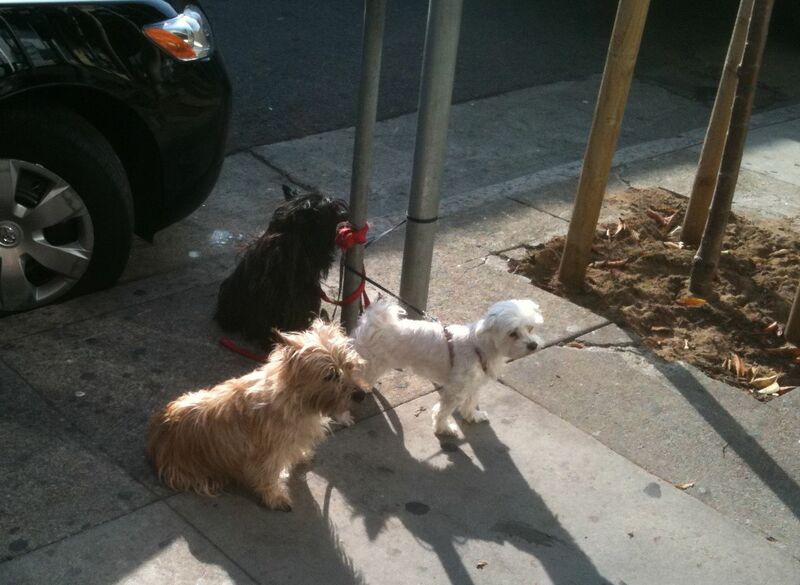 If there are dogs outside, however, go next door to Yancy’s for a beer and wait until they leave. You won’t be sorry. Selection of soft drinks and beer: Three Peppers. As in Rogue Valley, Oregon. We didn’t get a chance to scarf tacos with Sarah Palin, sadly, but we found a time and place to commune with our inner Teabagger and eat tacos and burritos with beer and sodas and our good friends Peter and Christopher. Follows the details…. I thought it’s really cool how they do that. Before we go on to the food, I’d like to point out how they had a great drink selection, and the drink dispenser had free refills! Free chips and huge selection of different kinds of salsa. And they have a great theme of birds! 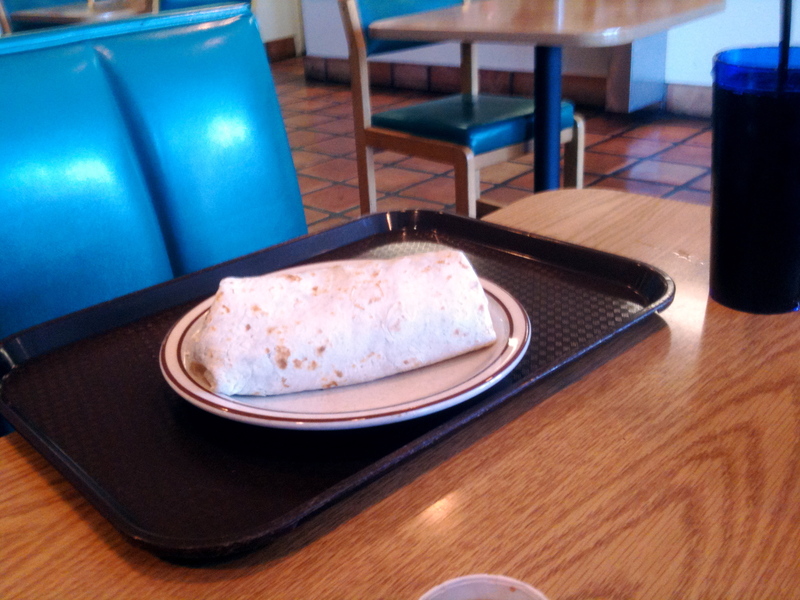 MATT: I had a burrito with pork, cheese, rice, beans, sour cream, mild salsa, guacomole, extra cheese, and cilantro. I liked it a lot. 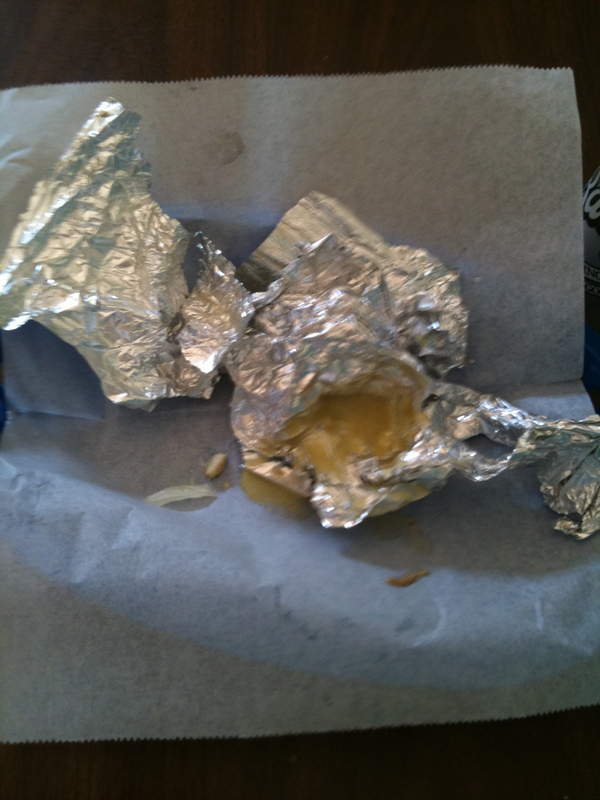 But I didn’t like the way they folded the burrito, because they did not wrap it in foil, and it fell apart before I touched it, so I had to eat it with a knife and fork. Otherwise it was wholesome, and satisfactory. 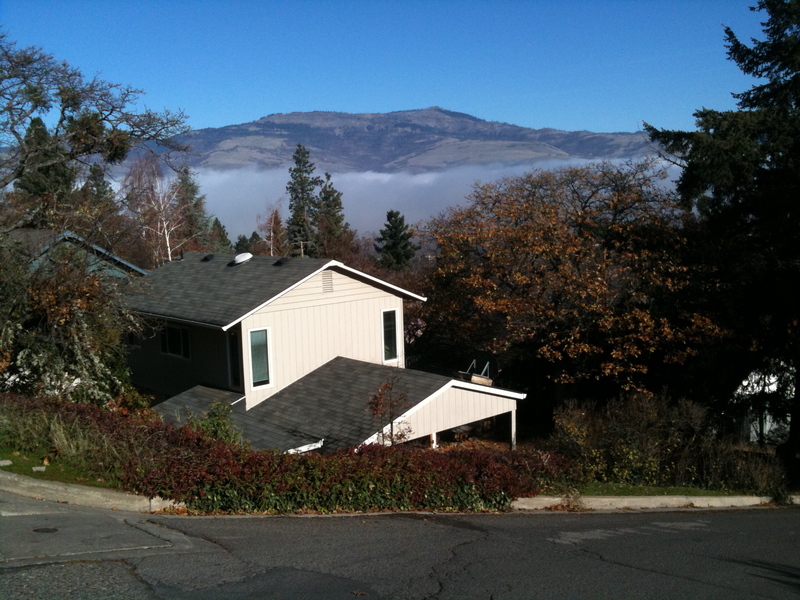 CHRISTOPHER: I live in Ashland and I’ve personally searched this part of the Rogue valley (Ashland, Talent, Phoenix, and Medford OR) and this restaurant I believe offers the best burrito! I had today a burrito with cheese, beans, rice, black olives and medium salsa. I have to disagree with Matt a little otherwise he got it all. I personally think that using foil sounds a little stupid but I have not tried it so… And my motto is the messier the better, but I didn’t get as much stuff as him. It’s comfort food and I love those things!! TACO GUY: Hi there. I wanted to like this place. The people are very nice; they want to do well. But: they steam their corn tortillas, which means that five seconds after they hit your plate they fall apart. The chicken is well grilled, but the pork is merely steamed and then shredded, and tastes like last week’s meatloaf, without the ketchup. So: Senor Sam’s is a lovely place to eat, but not a lovely place to eat tacos. Matt back: I say the burrito is great, better than the tacos, but if you want to stay clean, go somewhere else. Chris: One of my favorite things there is the wait is always is short and no cell phone use in line! MATT AGAIN: I think everyone has a different opinion. Dad did not like the food, while I liked it a lot. Chris thinks it’s the best ever, and I respect that. Yes, this taqueria is right by the beach, however, it’s called Guerrero’s Taqueria. When we got out of the car, we started to smell the aroma from the BBQ joint that was right next to the tagueria, and it was really hard to miss. It’s was so good, we wanted to have barbeque. But we came for tacos and burritos. When we got in the taqueria, we got in line, and waited until it was our turn. Dad decided to get a carnitas taco and a lengua taco, while I went for a carnitas burrito. The selection of soft drinks was huge, for you could get an american soda, like coke and Dr. pepper, or you could get a mexican soda which has sugar instead of corn syrup. Dad was happy at the different kinds of beer. They gave you chip ‘n’ salsa before the meal, for you to enjoy. I wasn’t 100% hungry yet, so I observed the place a little bit. They had a few candy machines, so I got a gumball, and saved it for later. Dad was already almost done with his tacos, but I was still observing the place. They had an ATM, and almost the whole restaurant had beautiful paintings all over the walls. 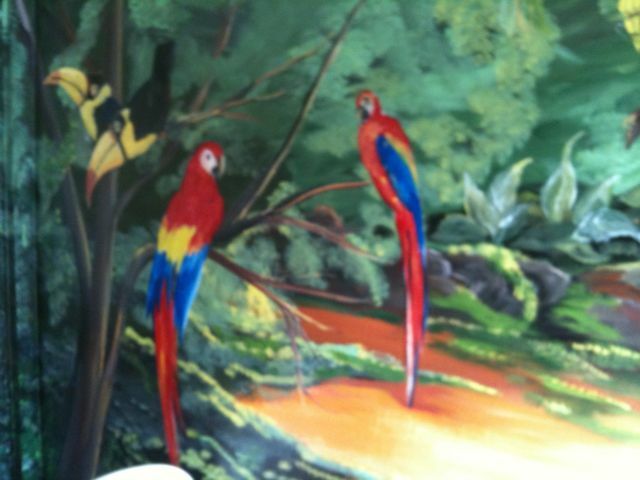 The paintings showed a beach in the tropics, which also adds to the title. They had tables outside, which were good for warm days, and there are a lot of them in Pacifica, where the place is. So when I got ready for the food, Dad was done and super satisfied. 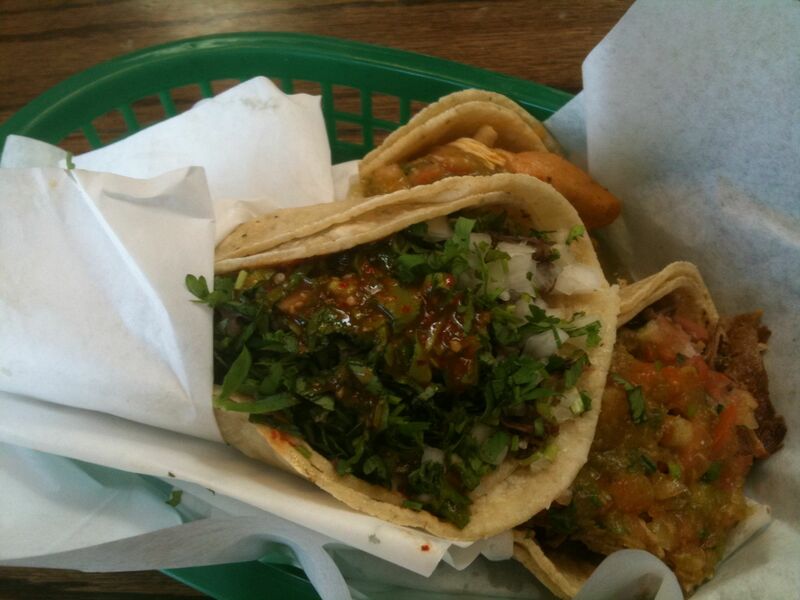 DAD’S REVIEW: Taco guy here: I had lengua (tongue) and carnitas. I cannot be objective. I believe that Guerrero’s carnitas tacos are the best I’ve had. 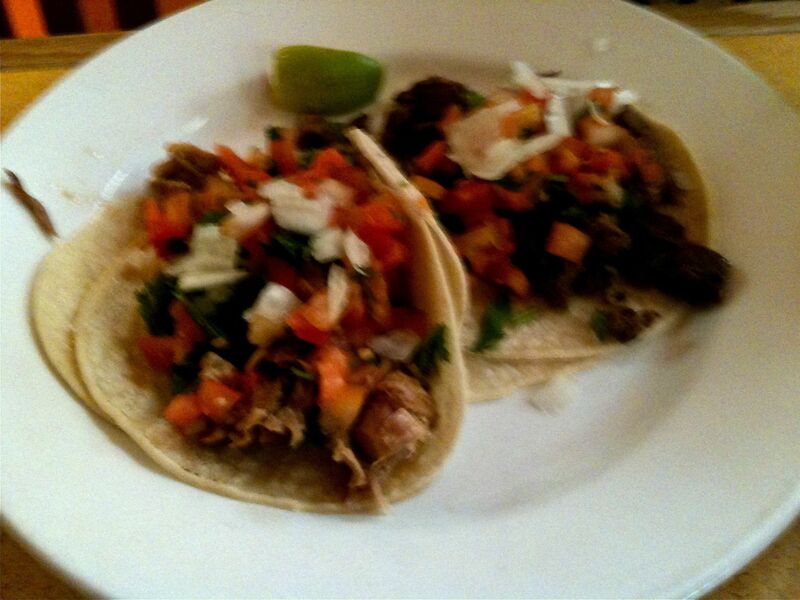 Their carnitas is a perfect combination of crisp exterior and succulent interior, full of flavor and savor. I also must describe their taco salsa as superb. I cannot say for sure what’s in it, though I believe it to be some combination of mangos, tomatoes, and peppers. Whatever’s in it, it’s sublime. The lengua is also good, among the best I’ve had. 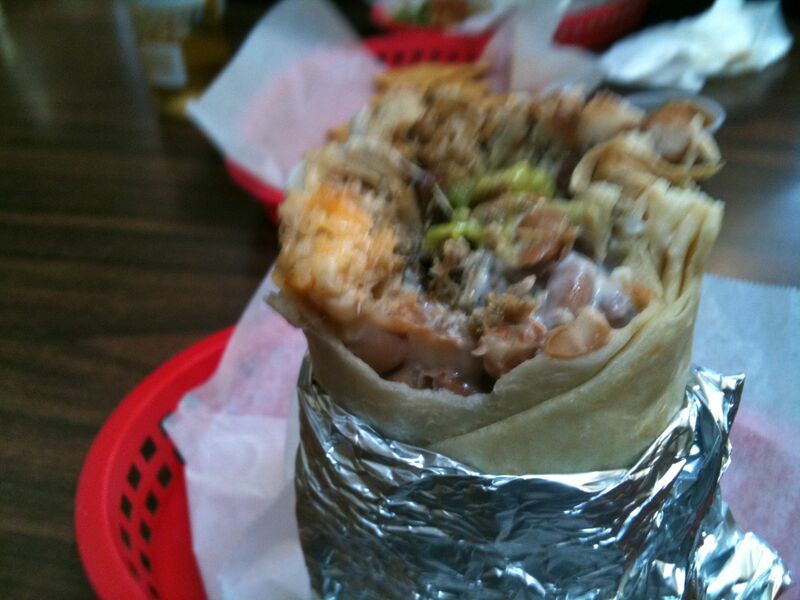 MY REVIEW: THe Burrito was very yummy, the tortilla was awesome, and so was the meat. The cheese was of average, as were the beans and guacamole. I liked the lettuce a lot, and the soda was awesome. 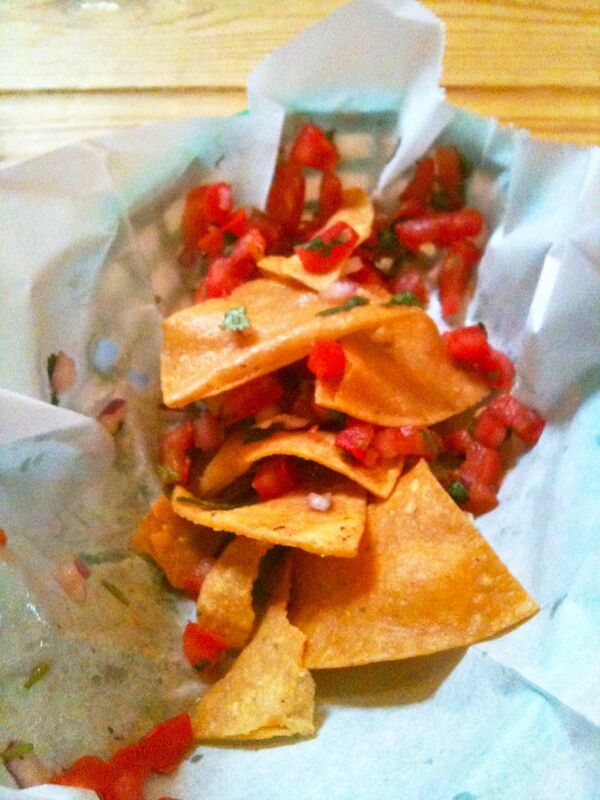 The chips ‘n’ salsa were nothing special, but satisfying. Overall, it was brilliant. There were technical difficulties. There were missteps. There were harsh words and recriminations. Now, we’re back, and there are tacos to blog. Soon.